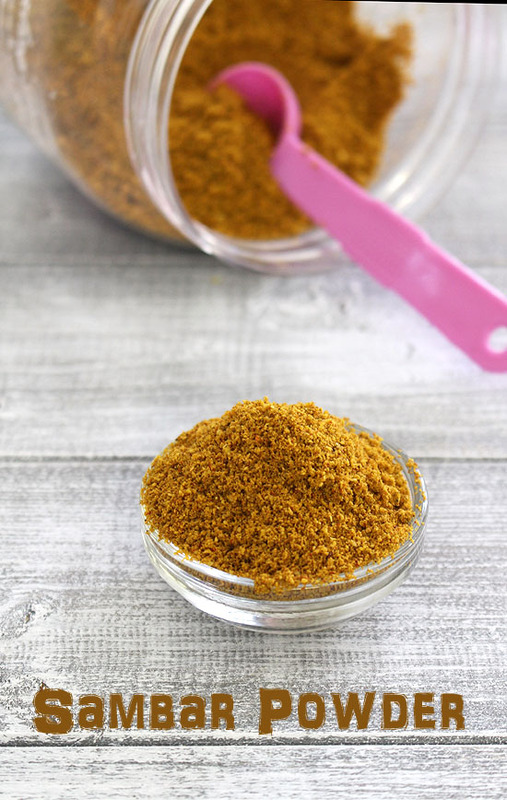 Sambar powder recipe – a unique spice powder blend from region of South India. Every household has their own version of making it, and today I am sharing my aunt’s recipe. When it comes to the homemade spice powders, I always make smaller quantities except the garam masala. Garam masala is the only blend that I use almost every single day in sabzi, curry or dal. The rest are used occasionally. So I make smaller batch and it lasts for 5-6 months for me. If you are making sambar every single day then you may consider to make a larger batch of samabr powder. For that, you can double or triple the quantity here. It is also called sambar podi or masala. This make the BEST sambar in my opinion. You must give it a try. I have been using this since last 8-9 months. Earlier I had good experience with Badshah Madras sambar masala. If you made the larger batch then I would suggest store them in big container. And keep another small container or add in your masala dabba for daily use. And fill it up as needed. By doing so, you are not opening the big jar every single day and so the masala stays fresh for longer period of time. 1) First gather all the ingredients, measure it out and then we need to dry roast all the spices and dal one by one. Let’s start with coriander seeds. Take them into a pan and turn the heat on low-medium. 3) Next roast the chana dal. 4) Keep stirring and roasting for even browning. Remove them to the same plate. 5) Similarly roast the toor dal as well. 6) Once light brown in color, dump that to the same plate. 7) Next take black peppercorns and small piece of cinnamon stick. Roast till peppercorns are aromatic and remove from the pan. 8) Then dry roast the red chilies till they are slightly darken in color. 9) Next cumin seeds till they are aromatic. Do not roast too much. 10) Then add mustard seeds to the pan. Once they starts popping, remove. 11) Next roast the curry leaves till they are crisp and no more moisture left. This ensure the longer shelf life of the sambar masala. 12) Then roast the methi seeds till light brown. 13) Now add desiccated coconut and turn off the stove. 14) The hot pan is enough to brown the coconut. Remove that to the plate as well. 15) Let them cool completely. 16) Once cooled, take that to the dry grinder or spice/coffee grinder. Add turmeric powder. 18) Remove that powder to a plate, while grinding it may become slightly warm. Let it cool down and then store in airtight container. this sambar powder stays good for 6-7 months in airtight container. Always use clean and moisture-free (dry) spoon to remove the needed masala powder. 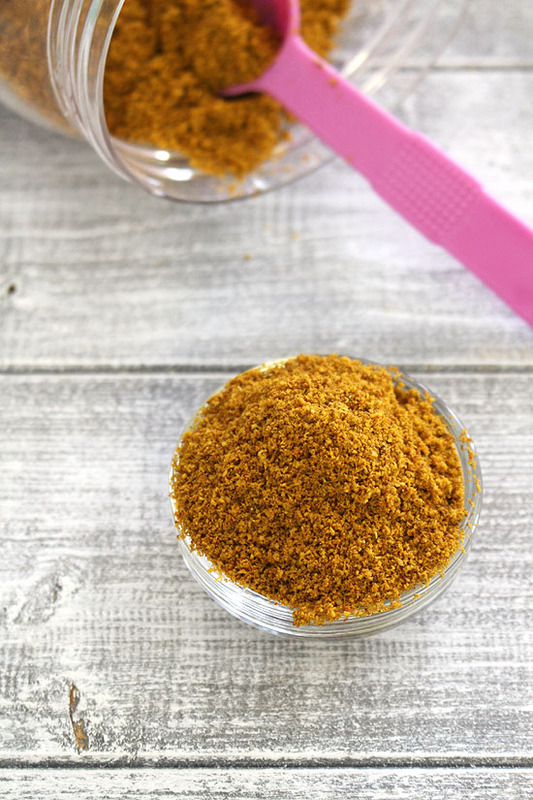 This sambar powder is used for making different sambar recipes like vegetable sambar, onion sambar. Add about 2-3 teaspoons of sambar podi for 2 servings of sambar. It can be added to sabzi or vegetable stir fry, poriyal in place of garam masala or poriyal masal for a different taste and flavor. This can be used in making kuzhambu (Sambar verity from Tamil Nadu) instead of kuzhambu podi as well. Sambar powder is used while making different kind of south indian sambar. First gather all the ingredients, measure it out and then we need to dry roast all the spices and dal one by one. Start with coriander seeds. Take them into a pan and turn the heat on low-medium. Next roast the chana dal. Keep stirring and roasting for even browning. Remove them to the same plate. Similarly roast the toor dal as well. Once light brown in color, dump that to the same plate. Next take black peppercorns and small piece of cinnamon stick. Roast till peppercorns are aromatic and remove from the pan. Then dry roast the red chilies till they are slightly darken in color. Next cumin seeds till they are aromatic. Do not roast too much. Then add mustard seeds to the pan. Once they starts popping, remove. Next roast the curry leaves till they are crisp and no more moisture left. Then roast the methi seeds till light brown. Now add desiccated coconut and turn off the stove. The hot pan is enough to brown the coconut. Remove that to the plate as well. Once cooled, take that to the dry grinder or spice/coffee grinder. Add turmeric powder and grind into fine powder. Remove that powder to a plate, while grinding it may become slightly warm. Let it cool down and then store in airtight container.